We know it's September and all, but we just can't shirk summer. 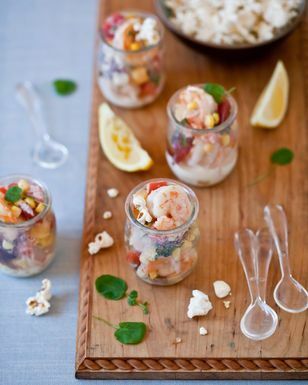 And corn, being the best of it, dies hard -- what better way to celebrate a season's bounty than with a shrimp and corn salad with shrimp brimming with secret ingredients? Southern food guru (and a great old friend of Amanda's) Virginia Willis stopped by to show Amanda how it's done (her way) with a Warm Summer Shrimp Salad from her new book Basic to Brilliant, Y'all. We could not stop eating it. As Virginia says, bon appetit, y'all! Get more of the delightful Virginia Willis at her website, on Twitter, and on Facebook and pre-order a copy of her book (out September 27th!). See (and save and print the recipe) here. This week's video was once again shot and edited by our videographer Elena Parker (who now produces our bi-weekly Dinner & a Movie column as well!). Beautiful picture, gorgeous woman! Great recipe, too! I love Virginia! But I'm being told by your Apache server that I'm forbidden to view the video. Is it me? Sorry about that! Can you trying viewing in a different browser (or maybe directly on Vimeo)? We haven't heard other reports of this error yet, but email us at [email protected] if it keeps acting up on you. I could listen to Virginia's voice all day - so soothing. And the recipe looks great! Yum! I'm making this as soon as I can get my hands on some good shrimp. Fabulous! Can't wait to make this! This video turned out so great! Yummm. I love Virginia too and this dish looks perfect. I'll bet it would take me back to when I lived in North Carolina with the first bite. The combination of VA and Amanda is unbeatable. Can't imagine they could create anything I wouldn't want to eat.